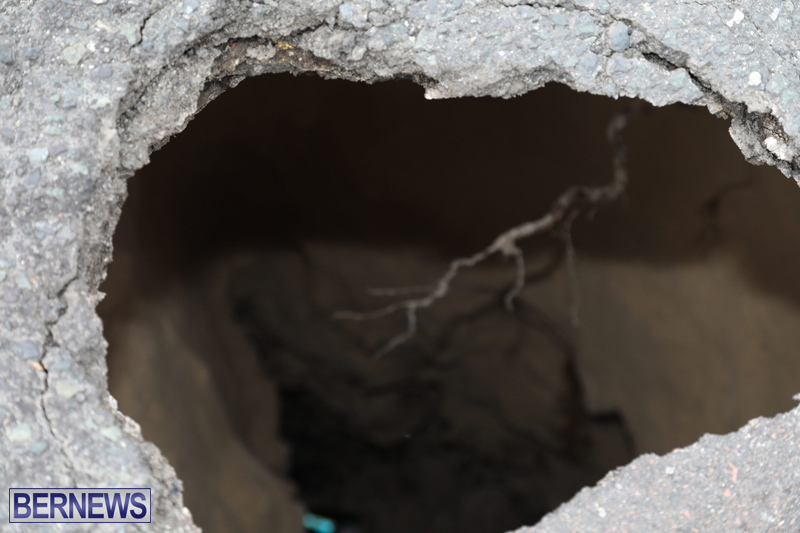 The police and Ministry of Public of Works are advising motorists to use caution on the North Shore Road, in the Shelly Bay area, due to a sinkhole in the road. 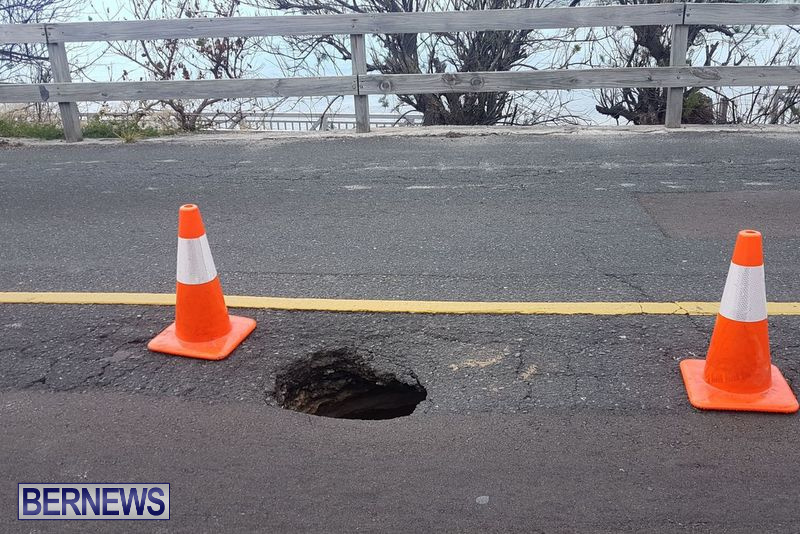 “The Ministry of Public of Works is advising motorists to use caution, along North Shore road, near Shelly Bay Beach, due to a large sinkhole which has formed,” a Ministry spokesperson said. Not surprised in the slightest. When you don’t resurface the roads and cracks develop the rain washes through these cracks and eats away the soil below the tarmac. I am surprised it hasn’t happened in more places! Wow, if Stevedoring Services/Corp of Hamilton were in charge of that we’d have the whole of North Shore Road closed to all traffic for at least a week. Contractors that do trenching work need to be held more accountable for when refilling/repaving. Not saying this is caused by a trench, but if it walks like a duck and smells like a duck. What is the long-term remediation plan for that stretch? The whole eastbound lane is sinking in and pushing outwards towards the edge. It’s all going to have to be dug up and shored up soon. Let’s spy on Kim Jong Un shrew de hole. Exactly! the hole is about 1 1/2 feet wide for crying out loud! Dump some ready mix in there and call the utility companies and tell them to do a more permanent fix later. They need to get to the bottom of this. Nice JohnBoy, I like that one. It’s all the OBA’s fault. Drama at it’s best. It’s not a sink hole/sinkhole. Puzzled is right. Need a Commission of Inquiry paid by the PLP money tree / family plan to get to the bottom of this. Puzzled is right. We need a Commission of Inquiry paid for by the PLP money tree to get to the bottom of this! Someone might look back out! someone pulled the plug on the plp,they went down the hole. That is a doorway to hell…we must have a priest and a policeman…perhaps Regiment on call in case Satan decides to pay us a visit. Remember…someone dug that hole from down….up! Let’s wait until erosion takes all of it. AND hire some EXPERTS, to tell us how to fix it. As usual those making the decisions to make things WRONG are right. Is this where the Sands 360 money has gone? China coming up to bail us out, we are going to need them.